Despising the ways and path of god...."
To the disciples of the black flame..."
Our allegiance is with thee. And cursed are the worshippers of the nazarene...."
You who have been said to have fallen from grace. Hear our call as we cry our in blasphemy. Come forth from the void and reveal yourself to me...."
"Hear us, oh infernal master. Grant that we may be of the chosen few. Knowledge and power are yours to bestow. Through you all will come to pass...."
On earth as it is in hell...."
Under thy protection all is done..."
Hear the words of which we speak. 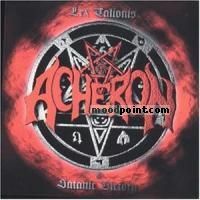 In our veins flows blasphemy...."
if you want to see other song lyrics from "Lex Talionis" album, click "Acheron Singer" and search album songs from the artist page. If you know some new information about Inri, or other song from our site, that isn’t already on song page, please let us know, Any refinement, news, or comment is appreciated. If information about Inri, or any song from moodpoint directory is wrong, please contact us and write where the incorrect data should be replaced by correct data. Use "Find Lyrics" box on our site, try to use different artist or (and) song title(ex: Inri) word forms.